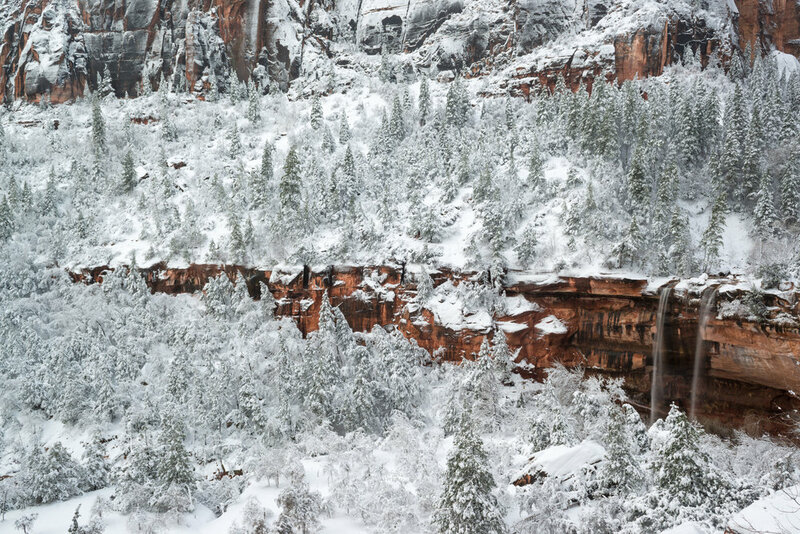 DATES: (4 DAYS) TBD Based on last minute forecasts - Snow accumulations which stick to the ground in Zion Canyon are rare, typically occurring only a couple of times a winter. For this reason, this workshop is a last minute registration situation. 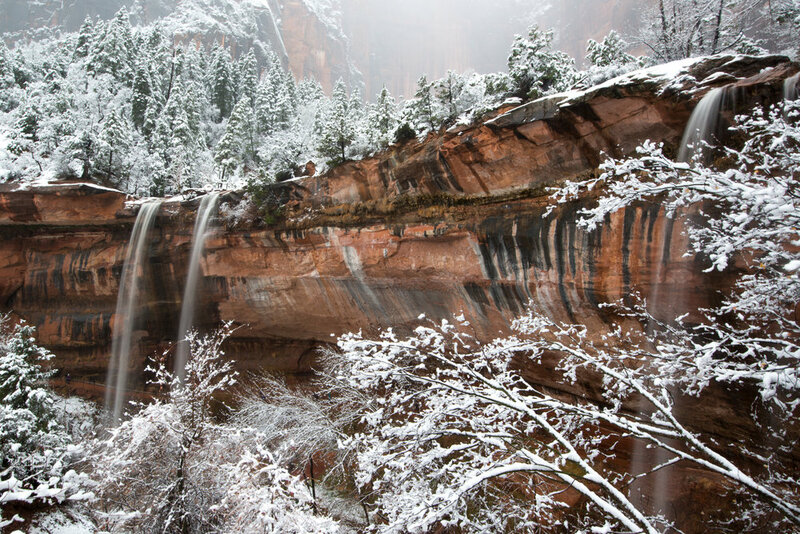 Being locals here in the canyon, we can assure you that there is no better time of the year than winter in Zion. Each season in Zion provides it's own spectacular displays which create amazing images, but winter storms arguably produce the most enticing photographs. Typically we receive very pleasant warm temperatures and lots of sunny days in the park. But on these rare events when we receive snow in the canyon, the character of the park displays a magical showcasing of the parks personality. Elegant and soft, your relationship with Zion will be forever changed after experiencing one of these events. In addition to the rich feelings that the park provides during these storms, winter photography in Zion National Park is an exciting endeavor, lending itself to unique images that few get the opportunity to capture. The brightness of the snow fills in the deep shadows of the canyon walls that exist during all other times of the year. The intimate scenes and large grand landscapes both photograph tremendously well. Photographing the vibrant red rocks of Zion with the contrasting brilliant white snow will create an experience and images that will keep you grinning from ear to ear for a long time, and will likely keep you coming back every winter. HOW TO REGISTER (open to 6 participants): We keep a tight eye on the forecasts here in the canyon and will contact interested parties once cold winter storm forecasts are looking strong and reliable. If you are interested in being contacted before we send a bulk email to our past clients, please submit the contact form at the bottom of this page. Once we announce the dates, the first 6 participants which commit to and pay the workshop tuition in full will have their space secured. PRICING: $1,500 plus tax (includes beverages and snacks). ITINERARY: This will be a 4 day workshop. We will have people fly in just before the storm arrives. This will give us the opportunity to photograph the canyon as it is snowing and it will ensure that everyone is able to travel safely before the storm. We will reach out to participants as soon as we see the storm forecast is solid. This will likely be around 4 days out from the storm. We have no set destinations from day to day as it is best to chase the conditions which will provide the best images. The workshop will be full of sunrises, sunsets and mid-day shooting. We may even be able to shoot some night images depending on the conditions. Although this workshop will be focused on Zion, depending on forecasts and travel conditions, we will likely also photograph Bryce National Park with snow at sunrise on at least one of our days together.